We have been providing Commercial & office carpet cleaning to businesses since 2001. We provide commercial office carpet cleaning to local businesses in Cheshire. Not only does having your commercial carpets deep cleaned improve the appearance and image of your business premises immensely, but the process also kills and removes bacteria which in turn improves air quality. Additionally, regular cleaning removes soil and grit from the carpets that causes premature wear, therefore extending the life of the carpet by several years. Commercial carpets can be an expensive investment and can be cleaned and restored at a fraction of the cost of replacement. We can also carry out a free test area clean while we survey your property for a quotation. The types of property we clean include office units, residential homes, shops, schools hotels and more. We also carry out end of tenancy cleans to commercial premises including floor restoration so your rented property is handed back in good condition. A well maintained business premises gives an impression of professionalism and efficiency. Many carpets in commercial buildings are sometimes poorly maintained, which leaves carpets looking worn and “tired”. It’s not the sort of impression you want clients and visitors to have when they enter your offices. 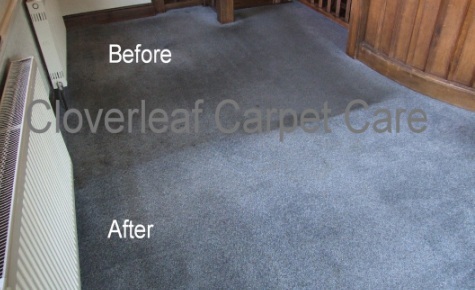 Poor maintenance also causes carpets to deteriorate and be replaced prematurely, which can be very expensive. Removing the soil and stains on a regular basis will give your carpets a bright and fresh look while maintaining a good clean image. A heavily soiled canteen carpet cleaned back to new condition. A heavily soiled and badly maintained restaurant carpet brought back to good as new. 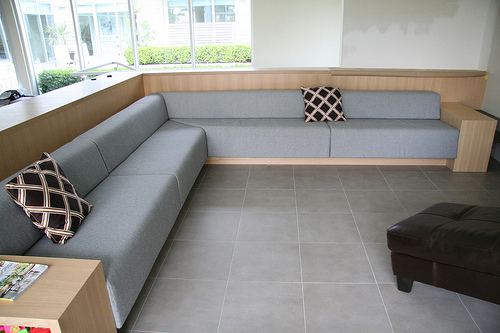 Commercial carpets are extremely durable. Typically, they are laid either from a roll or tiles. Most types of office carpet are constructed of a polypropylene low profile weave and are very stain resistant. In most cases we are contacted because of general through traffic soiling, stains that have accumulated such as coffee spills, oil marks, shoe scuffing and also water marks caused by leaks. We find that owners of commercial carpets may think that stains and soiling are a problem that may not go away and that replacement could be the only option. This is not usually the case unless there is severe wear to the carpet. Commercial carpet which still has a reasonable amount of pile can usually be brought back to acceptable if not impressive condition! All types of upholstery cleaned including office chairs and bench seating. It may be that the upholstery on your premises has coped with years of wear and tear. Office chairs, reception seating, pub bench seating/chairs or hotel upholstery can be cleaned at a fraction of the cost of replacement, usually with superb results. 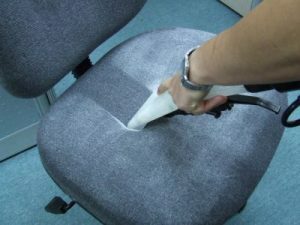 If you need office chair cleaning, why not give us a call today. What is the best way of getting a quotation? It just depends on what type of work requires carrying out. We can come along and visit your premises to have a look what needs to be done, or sometimes it may be possible to give an estimate or accurate quotation over the phone. Can the cleaning of carpets or upholstery be done out of hours? If you think that cleaning during working hours will be disruptive to your business, the work can carried out either during the evening or at weekends. Most commercial cleaning is carried out when the business is closed, however we have also done many jobs during opening or working hours. How long will it be before the carpets or upholstery can be put back into use? 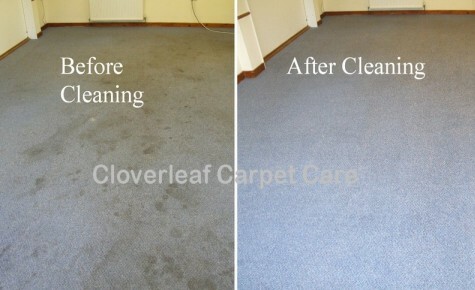 Commercial carpets can usually be used immediately after cleaning. Upholstery can usually be used either the next day or within 24 hours depending on when the work is finished. What about marks and stains? Most types of marks and stains can be removed during cleaning. The more troublesome stains such as oil, tar and food/drink spillages are treated with specialist stain removers. There are some types of stains which can be permanent such as food dyes and coffee, although on most occasions these are often removable. Water marks due to leaks on carpet. We often get called out due to leaks from roofs or drinks machines onto the carpet. The leaking of water onto the carpet can cause an unsightly dirty looking area and also a water line at the edge of the stain. This is the result of the soil in the carpet whicking up to the surface, which also indicates that the carpet is holding soil and requires cleaning. Water or spillage marks can usually be removed without a problem, but the surrounding area or whole room may also require cleaning to match the colour difference. Many commercial/industrial premises use vinyl and safety flooring in places such as walkways, canteens, and wc areas. Vinyl floors are popular for their durability and will last for many years. Some types of flooring are treated with a polish to give a solid protective layer which not only enhances the look of the floor but will also give an anti slip finish and help prevent scuffing. After several years this type of floor can become scuffed and worn and no matter what cleaning products are used, it seems nothing can be done to restore the appearance. In most cases we can usually restore this type of floor to outstanding condition. We also clean, restore and seal Amtico floors to many commercial businesses including shops.